A bit of background about Palais des Thés (PdT)before the review of four Grand Cru teas. The original Palais des Thes boutique is located in the Marais, described by PdT's marketing manager, Ines Bejot, as the "most charming place of Paris." There are 35 shops worldwide with half in France and five of these located in Paris. The shops outside of France are located in tea producing or tea drinking countries. PdT founder Francois-Xavier Delmas travels to the growers that supply tea to the company and blogs about his trips at Discovering Tea. I had the pleasure of taking a Grand Cru tea class with tea master Cynthia Chovet. 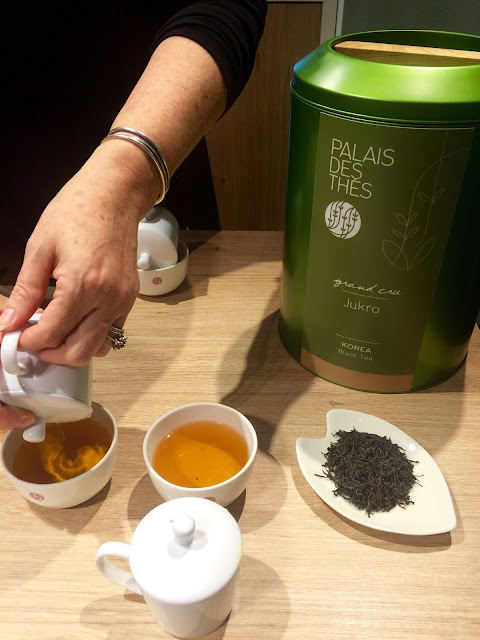 The Grand Cru Tasting is one of four classes offered at the Palais des Thes Tea School. Cynthia has many years of experience in the food and beverage industry. I was surprised to learn that she has only been with Pdt for one year; she spoke knowledgeably and passionately about the company. Cynthia's approach to the class was great! She spoke about the company, tea-ware, and the tea types and their regions, but waited for Ines and I to talk about what we tasted in each tea before offering her observations. 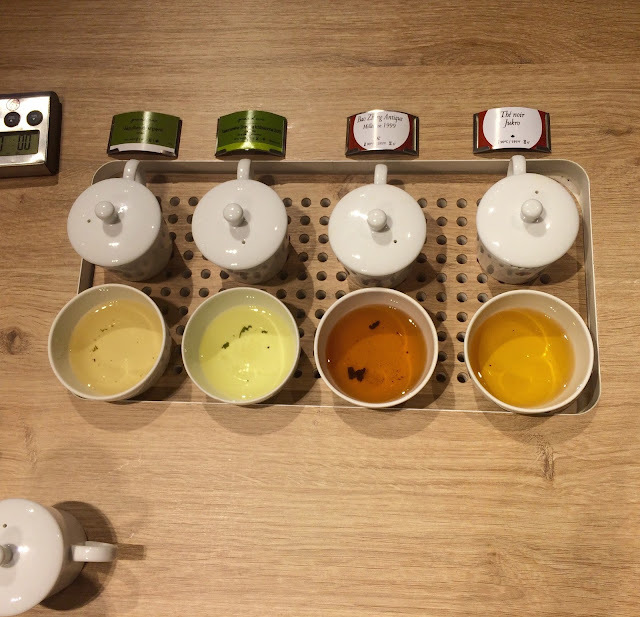 Four teas were prepared during the class: Silver Needle, Tawaramine Shincha Ichibancha 2015, Bao Zhong Antique 1999 (! ), and Jukro.You read the year 1999 correctly. 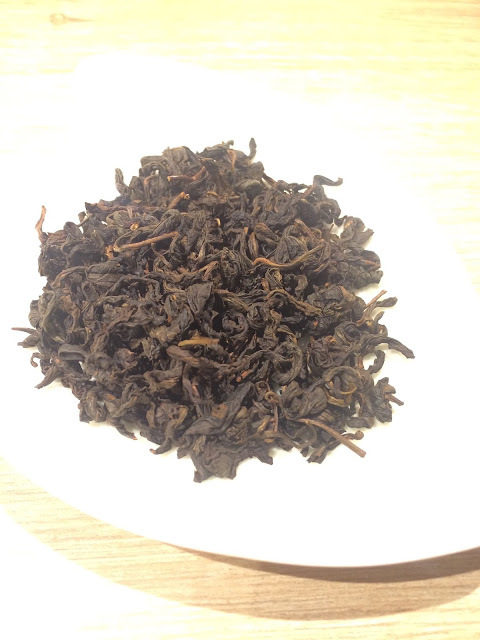 This oolong was aged for over 15 years, but I will provide more detail later on the post. 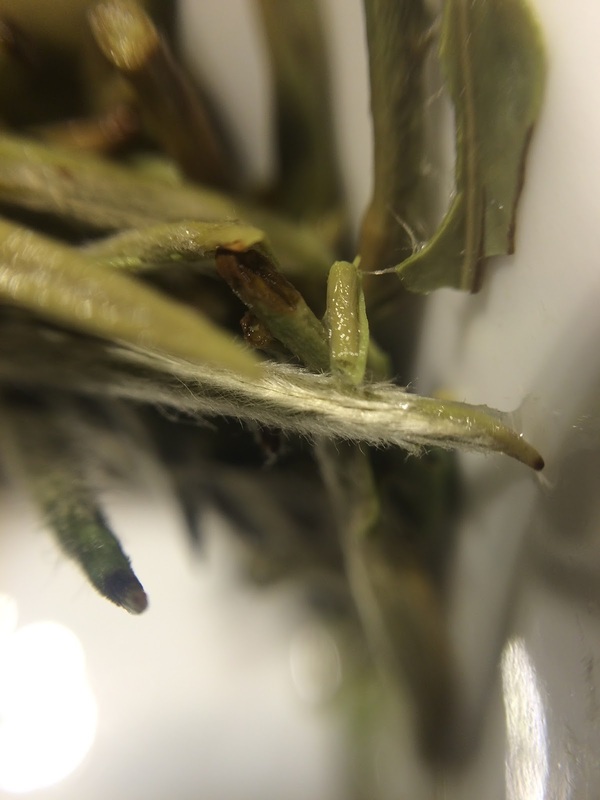 Also known as Yinzhen, this Fujian white tea is made only of buds. Look at all those silvery white hairs! Even after steeping, many of the leaves remained in their original state with prominent hairs. The liquor tasted of woodsmoke and chestnuts with a sweet finish. As the tea cooled, I detected notes of green like conifer needles, specifically juniper and pine. 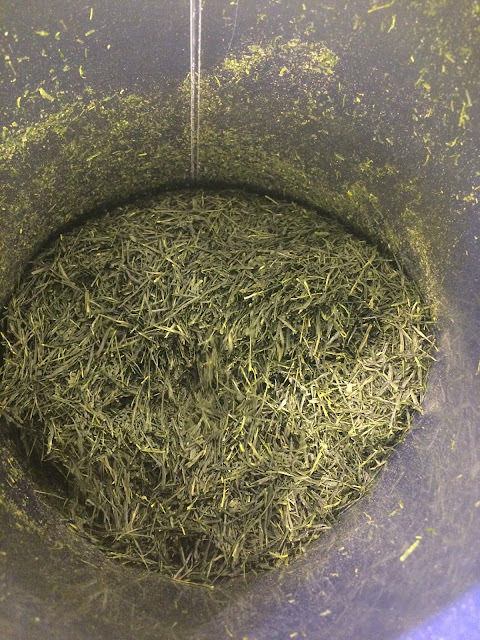 I felt fortunate to be able to taste a Spring 2015 Shincha! The dried leaves smelled heavenly with a deep sweet and cream aroma. The leaves appeared to leave a sort of resin on the interior of the canister. The liquor tasted like steamed spinach and mussels as well as fresh seaweed. The shincha had a long finish; the liquor stained my cheeks. The antique version of Baozhong, a Taiwanese oolong, is created through a yearly refiring. The non-aged version of this tea is Bao Zhong Imperial. The steeped leaves of the Antique smelled of charred wood with a cherry aroma at the end. It was an astringent tea. Its taste is also big and bold like a California red wine. 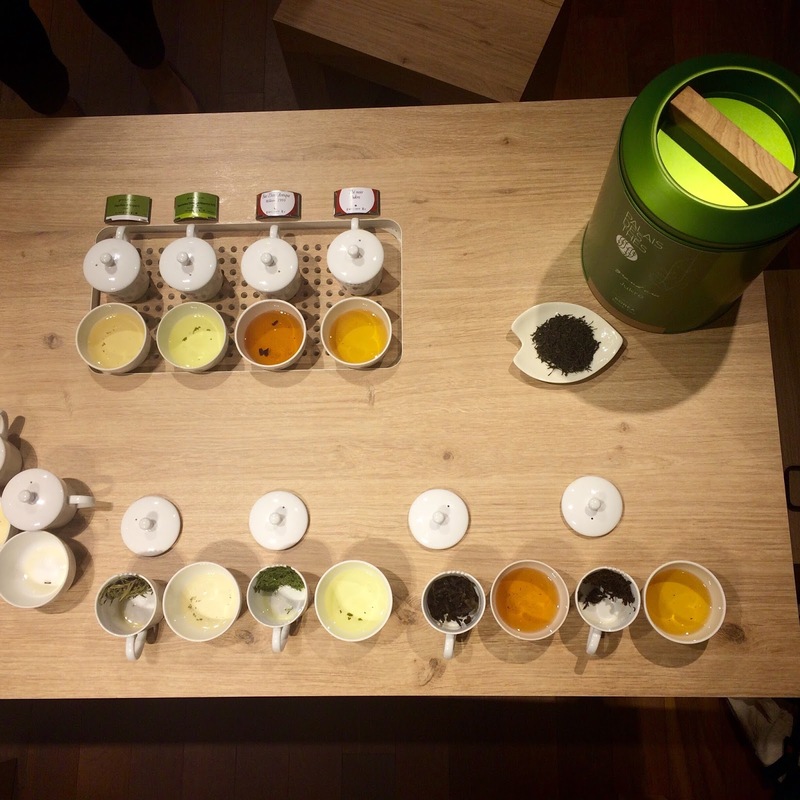 Coincidentally, we had the best tea at the end of the tasting. Korean black teas are unusual. This tea tastes heavily of chocolate! The dried leaves smell of chocolate and the liquor tastes of chocolate cake (Cynthia) and molten brownie (Ines). Cynthia detected a nutty flavor. I detected a floral note. The PdT website offers rose geranium as a possibility. With its berry undertone, the tea reminded of a single origin 72-80% chocolate bar. Thinking about tea and cheese pairings, I asked Cynthia for a cheese recommendation for the Jukro, and teas in general. She suggested identifying the note you want to highlight and finding a cheese with a similar flavor profile to make a match. Here's a pairing she recommends: Challerhocker, a nutty Swiss cheese, with Longjing. Cynthia's husband is a cheesemonger in Darien, Connecticut! Grand Cru Tasting Class courtesy of Palais des Thés. Thank you. P.S. Tea and cheese pairings at French Cheese Board and at In Pursuit of Tea. Hi, Alexis! Thanks. The Grand Cru tasting at Palais was fantastic. I'd love to do it again.